Hey guys… do you crave chocolate? You know, like really crave chocolate? So bad that; by the time you’ve come to your senses, you’ve managed to polish off half a bar of chocolate by nibbling on it throughout the day? This mindless pattern of eating can spark loads of guilt, regret and unhealthy mind chatter about ourselves… but it doesn’t have to be this way. You can indulge in your cravings in a healthy way so that you feel good about what you are putting in your body and liberated from those self-hate, restrictive, yucky thoughts. 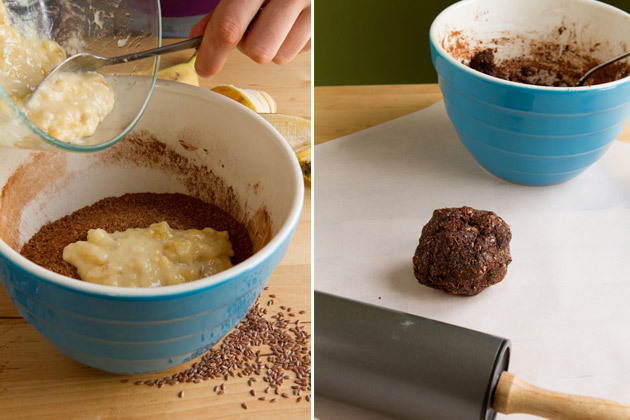 Are you ready to transform your chocolate cravings into something that feels good? What do you do when you’ve over eaten something or indulged in a food that you’ve been trying to avoid? How do you indulge in your cravings in a healthy way? 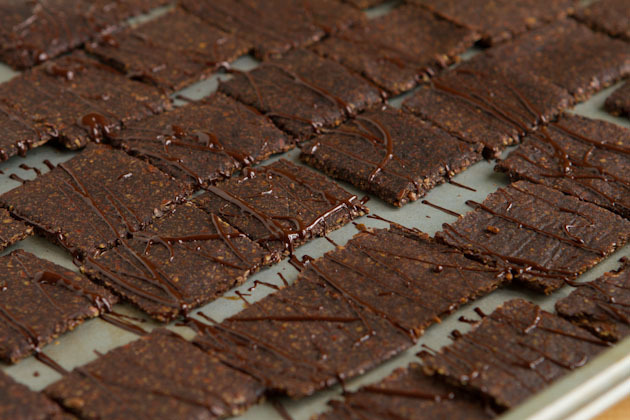 Give in to your chocolate cravings in a healthy way with these high fiber, grain-free dessert crackers! Each serving is less than 100 calories and squashes any chocolate craving that comes your way. Mash banana with oil and extract until fully broken down and soupy. Set aside. 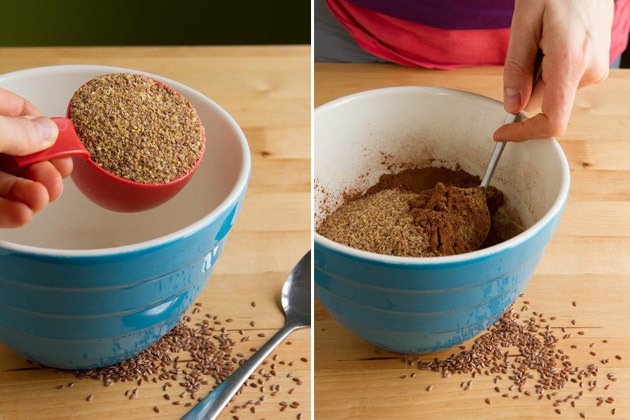 Add flax seed, carob powder, cinnamon and salt to a separate bowl and whisk to combine. 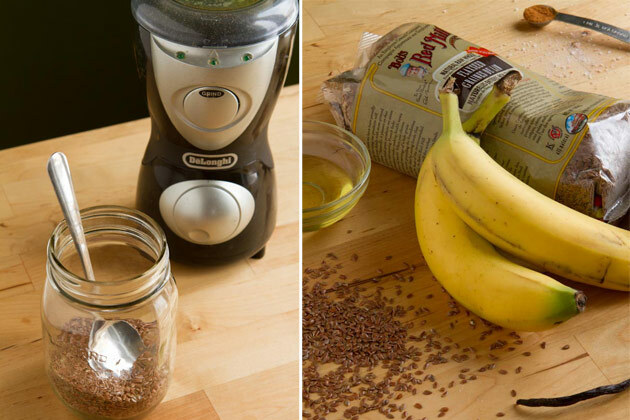 Add banana mixture to dry mixture and stir with a spoon until everything is combined well. The dough will be very firm, like cookie dough. Fold over the parchment (like a book) and then roll the dough between the two pieces of parchment until it’s about ¼-inch thick. Fold away the top half and cut or rip it away. Score the crackers into 1-inch cubes. Keeping the crackers on their current sheet of parchment, transfer the sheet to a baking sheet and repeat. Drizzle with melted carob or chocolate and allow to set for 30 minutes. I have been told that these types of grain-free crackers can be made with no oil. To do this, replace the 2 tablespoon of oil with 2 tablespoon of water. I have not tested this and cannot confirm that this will work. 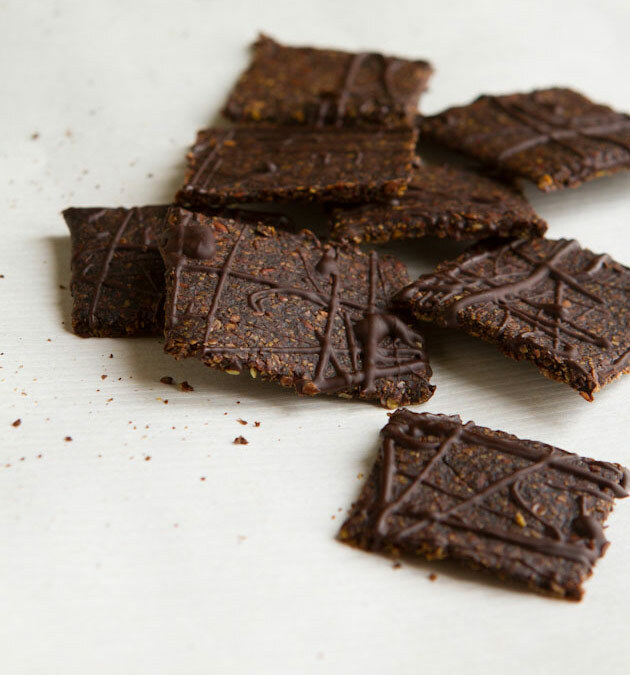 If you are allergic to banana, you could try making my apple grain-free crackers and replacing the sunflower seeds with carob or cocoa powder. The bananas in this recipe act as a natural oil in this recipe so I didn’t have to use much oil at all. As I mentioned in the notes of the recipe, if you’re sensitive to bananas, you could try my grain-free apple crackers instead. 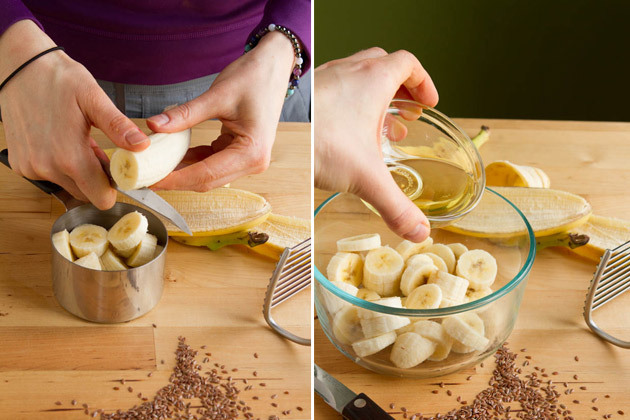 Once the banana is nicely mashed, you can add the dry ingredients and begin mixing your little heart out. The dough will be a similar consistency to cookie dough, so you may have to get your hands dirty. This dough is quite phenomenal. It can be cut and molded, rolled… and there are no grains! Ha! 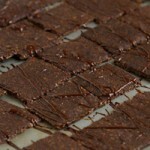 When your crackers are done, let them cool, drizzle with chocolate, and enjoy with a light heart! To learn more about your connection to chocolate and what your cravings could be telling you, check out this chocolate cravings post that I posted on the blog a couple of years ago.